I’m doing this one first because it is amazing. This is the best salisbury steak I have ever had. First, let’s start with the steak. 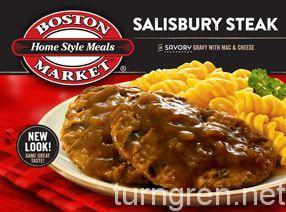 As a life-long mystery meat enthusiast, I already knew I liked salisbury steak…but I’ve never had any of Boston Market’s frozen meals before (in fact I’ve never been to a Boston Market at all). The steak is tender, and after eating probably 20 of these over the past month and a half, I have not once (knock on wood) found a bone in my steak. That wouldn’t have ruined it for me, I know it happens from time to time, but it’s definitely good to not encounter any. The gravy is superb – there are little onions in there, and it tastes amazing. The mac and cheese isn’t exactly something to write home about on its own, but the shape of the noodles – rotini – makes it excellent as a method to soak up and eat the extra gravy. My strategy is to eat the steak first, then use the mac and cheese (it takes about half of it) to mop up the rest of the gravy. It goes surprisingly well with the cheese. Once the gravy is all cleaned up, I eat the rest of the mac and cheese on its own. It’s still pretty solid mac and cheese, and can stand on its own. Like I said, this is the best salisbury steak I have ever had. That’s why I have eaten so many – they are cheap, and I have yet to get tired of it. 10/10 will buy again (even after I’m walking again). you paid by this frozen food company? This is the worst “food” ive ever tried.